The proteasome is a protein complex mostly known for its role in the degradation of unneeded, damaged or misfolded proteins. The proteasome plays a central role in all cells and hence a widely studied protein assembly. Malfunctioning of this protein complex has major effects on cellular processes and is known to lead to the development of a variety of diseases such as cancer and neurodegenerative disorders. The proteasome is also an important target for drug discovery; for instance, proteasome inhibitors are used for the treatment of multiple myeloma. However, not much is known about the biological mechanisms behind these treatments. 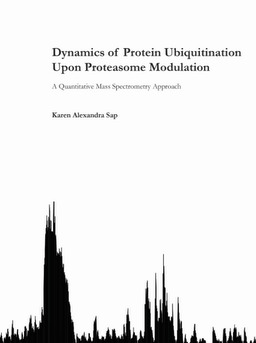 In this project we monitored the cellular responses in terms of protein abundance and protein ubiquitination dynamics upon proteasome malfunctioning (Chapter 3). In order to gain more insight into the specificity and function of individual proteasome complex components, we also manipulated single proteasome subunits, i.e., the proteasome-bound deubiquitinating enzymes (DUBs) and monitored the effects on the cellular (modified) proteome (Chapter 4). The proteasome is a key player in maintaining a balance in proteostasis under both normal and abnormal cellular conditions. In order to gain further knowledge about the functioning of the proteasome under such conditions we characterized the proteasome interactome under different stress conditions, such as oxidative stress, endoplasmatic reticulum stress and proteasome inhibition (Chapter 5). Large scale quantitative mass spectrometry is the central methodology applied in all studies described in this thesis. These types of global and unbiased approaches make it possible to study the relation of a protein complex with its direct cellular protein environment. In Chapter 6 we have monitored changes in the cellular environment upon activation of ecdysone-responsive genes, in terms of global transcriptome and global proteome dynamics, as well as in terms of ecdysone-receptor interactome dynamics. As such, this work provides several clues to address the relationship between mRNA and protein abundances in Drosophila.